What do dentists and magicians have in common? Well, more than you might think. Dentists and magicians perform slightly different kinds of magic, yet both can achieve dramatic transformations and right before your own eyes. A dentist, for example, can transform a person’s smile sometimes in just one single office visit and without anyone ever knowing exactly how it was done. Yet, some magic can be more mysterious than dentistry. Today, we’re in Hollywood, California at The Academy of Magical Arts with the magician Michael Grandinetti talking about his astonishing allusions that always create big smiles. So, this is the coolest place I’ve ever been to. Where are we? This is the clubhouse of The Academy of Magical Arts. This is an amazing place. Magicians from all over the world will come here to meet each other, talk about magic and watch each other perform. There are shows here every night. This is actually an old mansion that was built in 1903, so it’s over 100 years old. Right behind the wall over there is one of the largest magic libraries in the world. Thousands of books. Thousands of videos. For a magician, this is an amazing place. So, Michael, when did you decide to become a magician? I’m one of those really lucky people who found what they love to do early on. I was five years old. I got this magic set for Christmas and, for some reason, everything else under the tree that year just seemed to disappear, if you pardon the expression. [laughter] And I was just drawn to this magic set and from that point on I just knew I wanted to be a magician. Okay, let’s talk about Masters of Illusion on the CW Network. Fantastic, fantastic series. Tell us about it and how you got involved and what it is. I’m really proud of Masters of Illusion. It was a show that began this past summer of the CW and we did, so far, five episodes. We had a chance to really share with a mass audience around the country several of our original large-scale illusions. These are things that have never been on television before. Things that people haven’t seen before. and I was very proud of it. 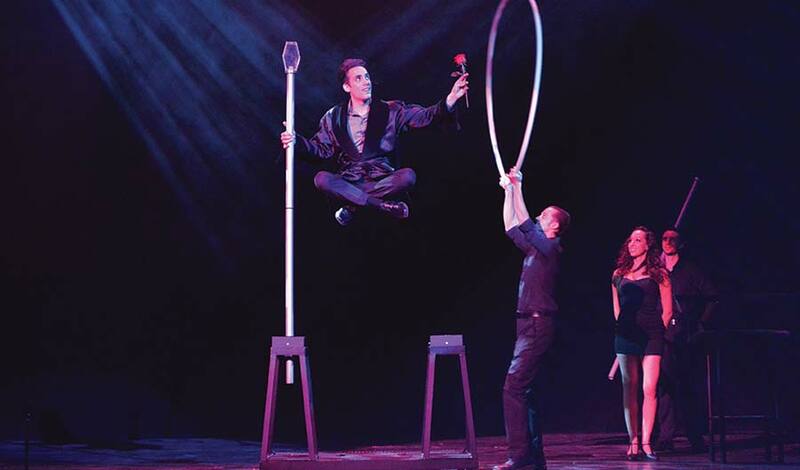 The show itself features magic from around the world, so you get quite a variety of magicians and illusionists. So, Michael, tell me about performing in Reno on the world’s largest stage. We had so much fun this summer in Reno. We were at the Grand Sierra Resort. It actually has the world’s largest stage. It’s over an acre in size. You can literally fit an airplane on this stage. So, we had to figure out a way to fill the stage with magic and we were able to perform some of my absolute favorite illusions in this show. One of them I’ll tell you about. We have this platform... it’s six feet above the ground. And we light the platform on fire and it instantly changes to me on a motorcycle. And that’s how we opened the show every night. In dentistry, we consider it magical to transform someone’s smile. Do you agree? You know what? To me, absolutely. I could walk through a steel wall or I could float in the air, but the amazing work that dentists do and that orthodontists do that is certainly magic to me. And it’s way more important magic than, walking through a steel wall because you’re affecting people’s health. You’re affecting people’s confidence and youâ€™re really allowing people to go out in their everyday lives and feel good about themselves. The other thing is, and this is amazing to me as a magician is that the technology that dentists and orthodontists use today to help people with their teeth, - like a good illusion, you donâ€™t even know that it’s there. People smile. People see you everyday and they may have orthodontic treatment going on right in front of you and you don’t even know it because it’s invisible. So, yeah, I like it. I think, in those respects, magic and dentistry can be a lot alike. So, you have a fantastic smile. How important is a fantastic smile in your business? Well, thank you, you know, I think it’s very important. I think the first thing when you walk on stage that an audience notices is your smile. You know, it’s what really connects you as a person to them. And that’s what they want to see. They want to see a person, somebody who they are going to get to know over the next 90 minutes and hopefully care about, so that warm, inviting, friendly smile is essential. It’s like when you meet somebody in life. You know, somebody gives you a really nice smile the first time you see it, you are just drawn in. On stage, I think it’s the same thing. And, when you were a kid, did you have braces? What was your oral health like when you were a child? Very regular dental visits. As I got into my teens, I did need orthodontic treatment, to help straighten some of my teeth. So, for about two to three years, there were regular visits to the orthodontist and, again, I am so thankful that I did it. It was so beneficial and looking back on it now, the path that I have chosen for my life, it was life changing. And I am so thankful that my parents encouraged that. How do you make sure your smile is as healthy as it can be? I’m very diligent about my dental health. I think it’s very important for everyone to keep healthy teeth and to have a healthy smile, so I brush and I floss regularly and I also schedule visits with the dentist regularly just to make sure everything with my dental health is absolutely top-notch. It’s very important to me. Would you prefer to perform larger scale illusions or up-close magic? You know, I enjoy them both very much, but for different reasons. Let me tell you what I mean. When we do our magic on the stage, it allows us to be very theatrical with it. We could add the music and add the lighting and add the staging it’s almost like creating these little movies on stage and I enjoy that process very much, but when you’re doing close up magic for people, it’s much more intimate. Sometimes, you’re performing for just one person or a small group and the magic is happening inches from their face you get to be right with them as they react and I enjoy that very much as well. So, since you like the up-close magic so much, do you want to perform some magic here and for our fans watching Dear Doctor TV? Absolutely. As a matter of fact, I brought a piece of magic with me that uses something that everybody should use everyday. 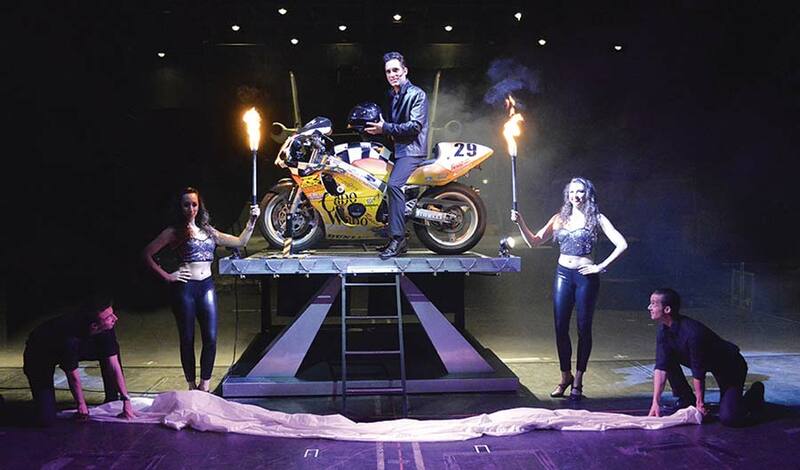 Illusionist Michael Grandinetti knows how to make an entrance. At the Grand Sierra Resort in Reno Nevada, he took to the world’s largest stage astride a motorcycle… one that magically appeared on a flaming platform six feet above the ground! His broad, mischievous smile let the audience know the fun was only just beginning. And drawn in, we were! At the Academy of Magical Arts in Hollywood, California, Michael treated us to some very up-close and personal magic. He also described the exact moment he knew he would devote his life to magic: It was under a Christmas tree in Pittsburgh, Pennsylvania; the future master of illusion was 5 years old. Michael Grandinetti levitating on stage. 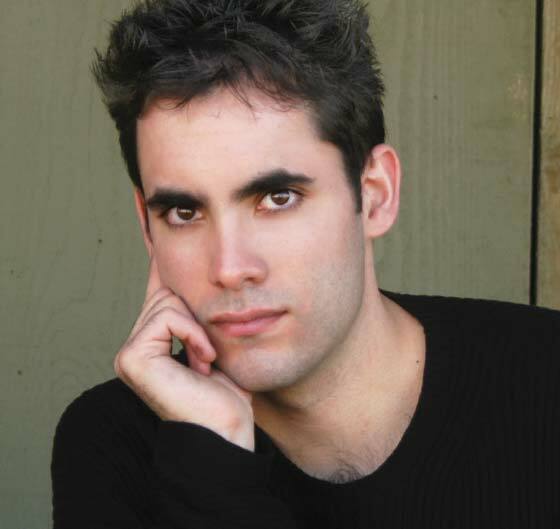 These days, you can catch Michael performing live around the country, or on television shows like NBC’s The World’s Most Dangerous Magic and The CW Network’s Masters of Illusion. The latter featured one of his all-time favorite illusions, walking through a steel wall — a tribute to his Pittsburgh roots. And as amazing as this all is, Michael believes it is no more magical than the orthodontics that transformed his smile when he was a teenager. Spending time with Michael was truly a delight, and we are looking forward to seeing what else this rising star in the world of magic has up his sleeve!